One of the biggest concerns about Gutenberg is how its arrival will affect WordPress sites’ preexisting content. Watching the Gutenberg team think through this problem and implement robust backwards compatibility has been both interesting and comforting. As we thought about our 600,000+ users of The Events Calendar, and what the process of transitioning to Gutenberg would be like for them, we wondered if there was anything more we could do to ensure the block editor would play nicely with preexisting event content on their sites. 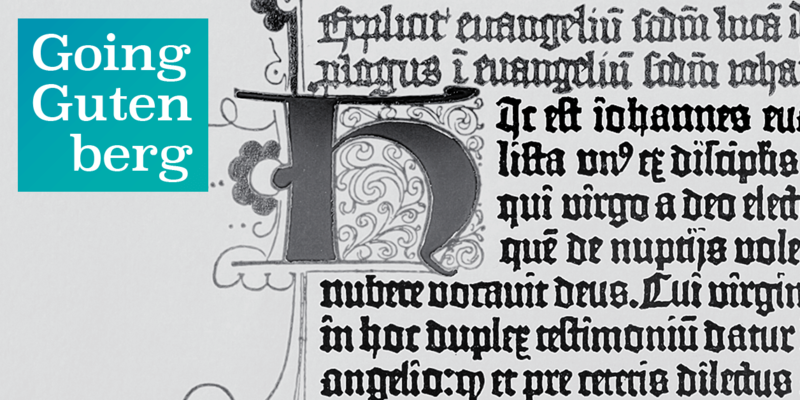 Thanks to the underlying work of the Gutenberg team, the data would be there, but it would now be broken up into separate blocks. We asked ourselves—would users find that confusing? And if so, how could we quell the fears about lost data and make it clear that their calendars and events hadn’t been negatively affected by the new editor? The default blocks shown to a user when creating a new event in the block editor. The problem when activating the block editor for the first time is this: The preexisting data from The Events Calendar survives, but it looks quite different. So different that it could easily be disorienting for users, and could give the impression that event data had been lost—even though it hadn’t. To bridge the gap between the classic editor (where most event data is in one meta box) and the new block editor (where most pieces of event data have their own block), we decided to create a “classic block”. 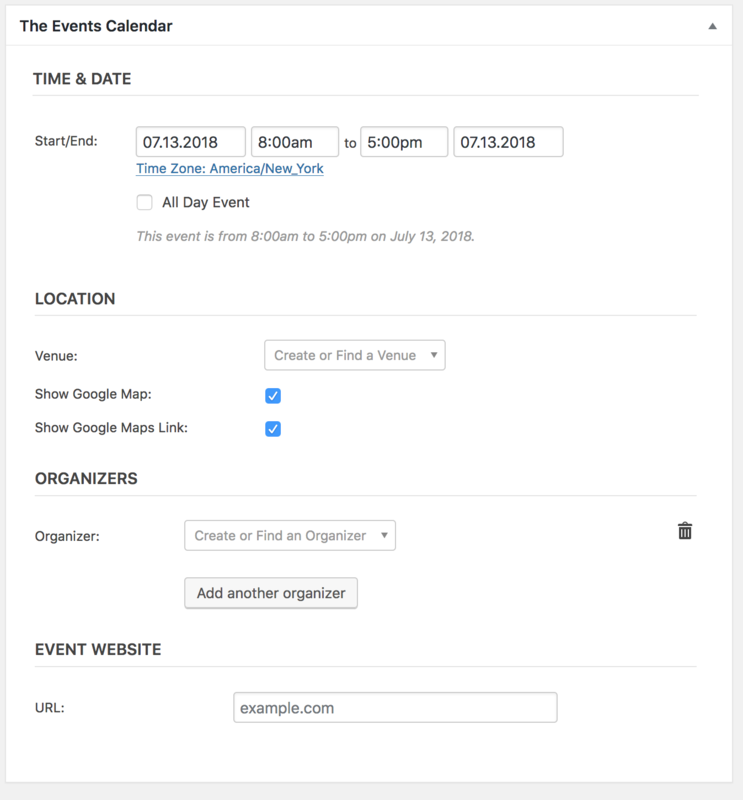 The aptly-named “Event Details Classic” block is basically a 1:1 recreation of the original “event details” meta box that all pre-Gutenberg users of The Events Calendar will be familiar with. The Event Details Classic Block on an event. This provides easy access to and higher visibility of some of the most essential pieces of event data. Plus, this keeps them in a more familiar data structure than having each part in its own disconnected block. How Long Will This Solution Last? The Gutenberg team has made clear that they’ll support meta boxes and the classic editor for the long-foreseeable future. As long as they support both things, so will we. We’ll also continue to improve our “classic block” philosophy as needed, possibly creating more classic blocks as we integrate other The Events Calendar add-ons with the block editor. The work of the Gutenberg team will ensure preexisting data from the classic editor on any given site remains intact. The importance of this cannot be understated, but for us, it’s still not quite enough—we want to ensure that content not only persists, but looks good and is preserved in as close to its original form as possible. 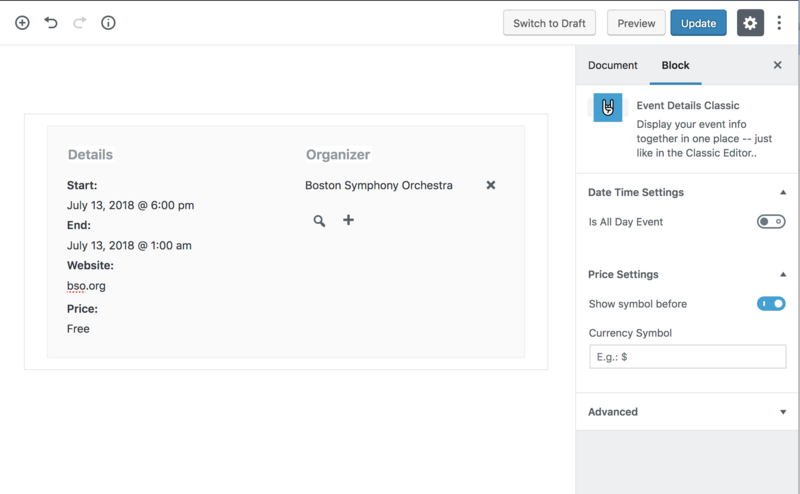 Our hope is that by having a good experience with the transition to the new block editor, users of The Events Calendar will feel comfortable experimenting with blocks and seeing just how much the new editor has to offer for old and new content alike. 🔔 Please Note: This is a blog series about active development and exploration. Anything we mention here is subject to change, and this blog series should be read as a tentative roadmap for our products—not an official release plan. Want the latest news delivered to your inbox? Sign up to hear more about all things Gutenberg, The Events Calendar, and more. 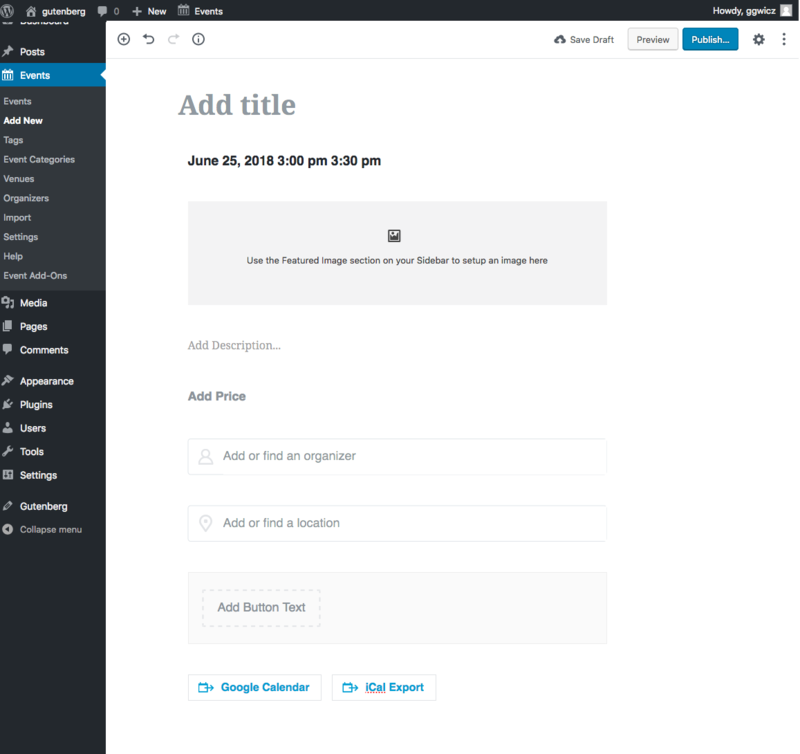 Try the new Gutenberg block editor with The Events Calendar now by downloading our Events Gutenberg extension.